This year’s report findings should help to further encourage the fundraising advocacy of your volunteers. If you could show a current or prospective volunteer information that illustrates the likelihood their efforts will be rewarded with success, would you use it? 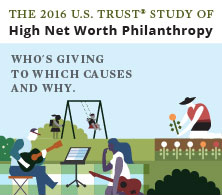 The sixth bi-annual U.S. Trust (IU Lily School of Philanthropy) study of high net worth individuals is again a treasure trove of insights to how high net worth donors think and behave. The 2016 study shows that 91 percent of high net worth households donated to charity, and 83 percent plan to give as much or more in the future. Experienced fundraisers know that volunteers give more than non-volunteers, and this study clearly provides the proof. The next time we get in-front of a group of fundraising volunteers, we’re going to share the results of this study to boost their confidence and dispel their misplaced fears of rejection. We suggest that you read this study and share it with your volunteers too. The study offers an optimistic view of future giving levels, with 83 percent of wealthy individuals planning to give as much (55 percent) or more (28 percent) in the next three years (through 2018) than they have in the past. Women, African Americans, and younger individuals (age 50 and under) are even more likely to increase their giving in the next three years. Future levels of volunteerism are also promising. Among wealthy individuals who currently volunteer, 90 percent say they plan to do so as much (60 percent) or more (30 percent) over the next three years. Even among those who did not volunteer last year, 39 percent plan to do so during the coming years. This research series is the most comprehensive and longest running of its kind, and an important barometer for wealthy donors’ charitable engagement and perspectives. Key findings from this latest research offer valuable insights that help inform the strategies of nonprofit professionals, wealthy donors and charitable advisors alike. The study is based on a nationally representative random sample of wealthy individuals, including, for the first time, deeper analysis based on age, gender, sexual orientation and race. This expanded methodology enables further exploration of the philanthropic trends, strategies, and behaviors among the HNW population. On average, wealthy donors gave to eight different nonprofit organizations last year. However, this number varied based on a donor’s age – for instance, donors over the age of 70 gave to an average of 11 organizations and baby boomers gave to seven, whereas younger donors (age 50 and under) gave to five. Sixty-three percent of wealthy donors gave to basic needs organizations last year – making it the charitable subsector supported by the largest percentage of HNW households. Additional causes supported by the greatest percentages of wealthy donors included religion (50 percent), education (45 percent), the environment (42 percent) and health (40 percent). With respect to giving to education, 31 percent of respondents gave to higher education and 33 percent gave to K–12 education. Among the wealthy, volunteering with a nonprofit organization has a strong correlation with giving to that organization. A large majority of HNW individuals (84 percent) give financially to at least some of the organizations with which they volunteer, while 49 percent give to most, if not all, of the organizations where they volunteer. While many wealthy individuals experience a high degree of personal fulfillment from their charitable giving (42 percent), even more experience it through their volunteerism (63 percent). Women reported deriving greater levels of fulfillment from volunteering than men, as did younger individuals when compared to those over the age of 50. A variety of motivations drive HNW philanthropy. In 2015, wealthy households cited the following among the primary reasons they give: believing in the mission of the organization (54 percent); believing that their gift can make a difference (44 percent); experiencing personal satisfaction, enjoyment or fulfillment (39 percent); supporting the same causes annually (36 percent); giving back to the community (27 percent); and adhering to religious beliefs (23 percent). Just 18 percent of wealthy donors said they gave largely because of tax benefits in 2015. Wealthy donors have strong feelings about how the nonprofits they support should use their contributions and conduct themselves. After making a charitable gift, 89 percent of wealthy donors said it is important that the organization spend only a reasonable amount of their donation on general administrative and fundraising expenses. Wealthy donors also indicated that it is important that the organization demonstrate sound business and operational practices (89 percent), acknowledge donations by providing a receipt for tax purposes (88 percent), not distribute their names to others (84 percent), and honor their requests for anonymity (83 percent) and for how their gift is to be used (83 percent). Nearly one out of five wealthy individuals stopped giving to at least one nonprofit organization last year. When individuals stopped giving to a particular charity they previously supported, among the reasons cited were because they received too frequent solicitation from the organization (41 percent), circumstances in their household changed (40 percent), the organization was not effective or did not sufficiently communicate its effectiveness (18 percent), or the organization asked for an amount the donor felt was inappropriate (14 percent). Wealthy individuals reported their greatest challenge when it comes to charitable giving is identifying what causes they care about and deciding where to donate (67 percent). Other charitable giving challenges include understanding how much they can afford to give (50 percent), allocating time to volunteer with the organizations they care about (45 percent), and monitoring giving to ensure it has its intended impact (37 percent). This study also found that, among the 33 percent of wealthy donors who participate in impact investing, 61 percent approach it as something they do in addition to their existing charitable giving, whereas 34 percent do so in place of at least some of their charitable giving. And just 5 percent of wealthy donors participate in impact investing in place of all of their charitable giving. The study found notable relationships between wealthy individuals’ level of knowledge about giving and their giving behaviors and characteristics. When comparing individuals by levels of charitable giving knowledge (i.e., expert, knowledgeable, novice), higher levels of knowledge directly correlate with whether individuals monitor the impact of their giving, believe their giving is having its intended impact, consult with advisors, and utilize giving vehicles (e.g., private foundation, donor-advised fund), as well as with greater personal fulfillment from giving and higher average giving amounts. Overall, 44 percent of wealthy donors believe their giving is having the impact they intended, while 54 percent are not sure whether their gifts are achieving the impact they desire. This may be partly due to the fact that 78 percent of wealthy donors do not monitor or evaluate the impact of their charitable giving. Nearly all wealthy individuals (94 percent) would like to be more knowledgeable about at least one aspect of charitable giving, with the highest percentages of these individuals interested in learning how to identify the right volunteer opportunities (42 percent), becoming more familiar with nonprofits and how they serve their constituents’ needs (29 percent), and how to engage the next generation in philanthropic giving (20 percent). “Nonprofits that understand the priorities and expectations of their wealthy donors, engage them in meaningful and fulfilling ways, and communicate the organization’s impact can effectively partner with donors to achieve their mutual goals for a better world,” said Una Osili, Ph.D., professor of economics and philanthropic studies and director of research for the Indiana University Lilly Family School of Philanthropy. Among the 79 percent of HNW households surveyed who indicated having children, grandchildren or other younger relatives, just 21 percent have family traditions around giving, such as volunteering as a family or giving together to charity during the holidays. African Americans, Asian Americans, Hispanics and women were significantly more likely to indicate that their household has family traditions around giving. Younger individuals were twice as likely to have family traditions around giving as those over the age of 50. Similarly, far more individuals reported not involving their younger relatives in their giving (72 percent) than those who do (28 percent). Once again, African Americans, Hispanics, women and younger individuals were significantly more likely to indicate that they have involved younger relatives in their giving. Among wealthy individuals who involve younger relatives in their giving, the majority found the experience personally rewarding (77 percent). When asked how they would like to ultimately distribute their wealth, HNW individuals reported that they intend to leave the majority to their children and grandchildren (75 percent), with other heirs receiving the second-highest percentage (14 percent). Respondents intend to leave 12 percent of their wealth to charities (8 percent to secular charities, and 4 percent to religious charities). Twenty-four percent of wealthy individuals contributed to a political candidate, campaign or committee last year or plan to do so during the 2016 election season. Among this group, donors over the age of 70 (40 percent) and LGBT individuals (38 percent) were more likely to make such political contributions. View it as an opportunity to exercise their voice (56 percent). Hope to influence the outcome of elections (49 percent). Believe their contribution can make a difference (46 percent). Feeling such contributions would have little to no impact when compared to corporate contributions (47 percent) and contributions from political action committees (PACs) (26 percent). Believing such contributions won’t make a difference (31 percent). Not having a particular candidate they would endorse (26 percent). Results of this study are based on a survey of 1,435 U.S. households with a net worth of $1 million or more (excluding the value of their primary home) and/or an annual household income of $200,000 or more. 3 Average giving amounts are calculated excluding ultra high net worth households (those with a wealth level greater than $20 million) because our data is only able to provide an aggregate value for giving by these households, not individual giving values. We cannot use an aggregate value when looking at individual characteristics.